We can serve others out of love but we cannot love others without serve them. Everyday, I always have lots of need-to-be-done things at home. If I did it out of love, I could serve my family without complaints. But sometimes, I did complain. Tired. Bored. Pain. Sore. etc. I am so thankful to have a husband like Dave. I thank God for his kind heart, generous heart and lovely heart. So thankful that he will do whatever he can to help others. Most of all, he always be there when I need him. He always encourage and help me when I was down, and he encourage me to do things that he thinks I can do it. Yes, what I want to say here that Dave is a supportive husband. My prayer that God continue work in him, through his life to bless others. I pray that others will see and glorify God through Dave’s life examples. I praise God for Dave. This 30-day Husband Encouragement Challenge is so challenging. Today is my first day. I realize that my husband is a great wonderful gift ever! I thanked God for sending him to me, for using Dave to draw me close to God and help me to love Him more than before. God use my beloved husband to discover myself and his in the bonding of God’s love. I thank God for leading us together and become blessings to each other. I thank Dave for choosing me above all other women he knew in his life. I thank God for our marriage and all His blessings in our life together through sad and happy days, healthy and sick, rich and poor. I am so blessed and so glad to be his wife. Our marriage has changed me a lot, I have learned a lot through his life, his efforts, his generosity, his love, his examples, his daily words and actions. Truly, he’s the one. Weddings are about vows. The flowers are fragrant, the dresses beautiful, and the tuxes dashing, but the promises take center stage. Yet compared to the high costs of typical weddings, the vows come cheap. The promises a bride and groom exchange cost nothing to say. But they cost everything to keep. They can be said calmly in less than twenty seconds, but they are meant to be lived out for a lifetime. For this reason, I have asked couples during premarital counseling to join me for one session of attention to the vows. I usually take them to the very place where they will say them to each other and then I explain the plan. Since the wedding is not a setting where we can talk at length about the vows, it is crucial that both partners express what they intend the vows to mean and seek to understand their partner’s meaning. 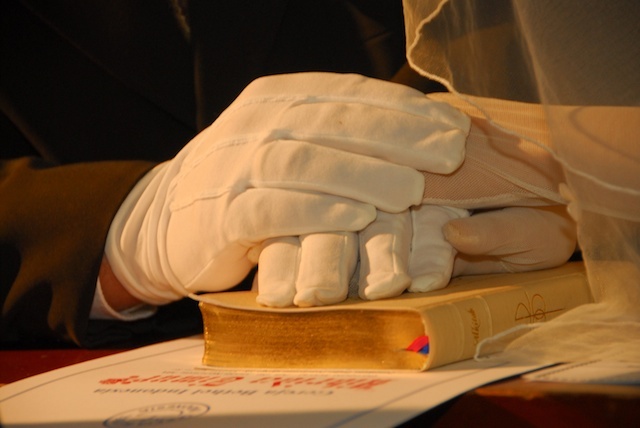 Often this is the first time a couple actually thinks about the content of the vows. Sometimes they’re surprised by the promises.